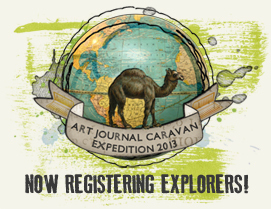 Information, news and articles on the Art Journal Caravan workshop. Happy Monday friends. 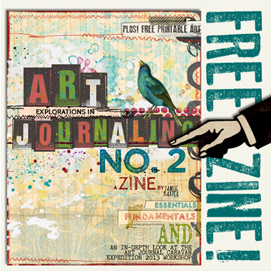 Carolyn here with gallery highlights of week 29′s Art Journal Caravan! I’m playing catch up on the weekly highlights today. I’ve been on vacation and wasn’t able to get the posts published, but I’m home now and typing my fingers to the bone to get some inspiration sent your way. Hope you enjoy. Thanks for joining me for another week of highlights. Don’t forget to check in later today for more great inspiration. Until then… I’ll see ya on the trail. Happy Monday friends. 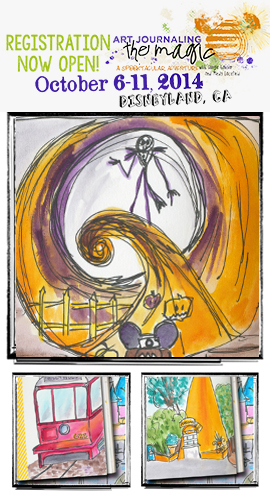 Carolyn here with gallery highlights of last week’s Art Journal Caravan! I just got back from 2 1/2 weeks of vacation! It was pretty crazy. I brought my laptop with me so I could keep up with the Weekly Highlights but it just didn’t work out, so now I’m going to be playing a little bit of catch up. I’m going to try to get all 3 weeks posted today but if I don’t, keep your eyes on the blog, it will be coming. Hey everybody!! Hope you’re having a fantastic day. I’ve had a super fun, creative day and got lots accomplished. If you’re looking for a little inspiration I’ve got some to show you! Sit back and enjoy. Happy Monday friends. Carolyn here with gallery highlights of last week’s Art Journal Caravan! It was a quiet week in the gallery with the USA celebrating it’s Independence Day on July 4. I did a little search on the Interwebs and found that July is actually a pretty popular month for countries to become Independent : )) Go ahead, take a look for yourself. Thanks for joining me for another week of highlights. Don’t forget to check in next Sunday for more great inspiration. Until then… I’ll see ya on the trail. Happy Monday friends. Carolyn here with gallery highlights of last week’s Art Journal Caravan! I’ve been getting all sorts of creative projects wrapped up and I’m loving it. I find inspiration in SO many places, especially here in the gallery. I hope you find something that sparks your creativity here. Happy Monday friends. Carolyn here with gallery highlights of last week’s Art Journal Caravan! Hope you all had a fun and crafty weekend. I’ve got some pretty stuff to show you. Happy Monday friends. Carolyn here with gallery highlights of last week’s Art Journal Caravan! Can you believe I’m actually here on MONDAY?? LOL Again, I must apologize for the last couple weeks of not posting on time. I’m so glad that things are getting back to normal. Happy Wednesday friends. Carolyn here with gallery highlights of last week’s Art Journal Caravan! I apologize for another late post but it seems that madness has taken over my life the past couple weeks. I think that things are winding down now and next week should be back on schedule. Whew! !